A young man’s wartime death increases pre-existing tensions in a Midwestern community even as nightmarish weather approaches. . . . the quiet revelations that emerge lend [the novel] a surprising power. Walsh is incredibly intelligent, fierce, and, at times, tender with her prose. What excites me most about Twister is its ambition. … an outstanding debut. You will have to read this novel for yourself to see how a brilliant writer has found the perfect form for evoking the effects of time and place and the forces of history and nature on the lives of human beings. As the title suggests, the movement of Twister is as inexorable as it is unpredictable. Genanne Walsh is a writer of extraordinary powers. The work of this novel is both raw and lush with poetry. Her characters live and breathe, and in their intersections, real truths are revealed. 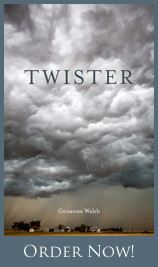 Genanne Walsh’s Twister is a chronicle of a small town amid the calm before the storm— but so much more. This book digs beneath the surface of place to create a kind of Spoon River Anthology for our time replete with secrets, truths, startling reckonings—and very, very threatening weather. As fine a new novel as you will read this year. By turns terrifying and humorous, clear-eyed and deep-hearted, Twister brings us into the center of a storm as a small Midwestern town mourns the death of a young soldier. Rose, the soldier’s fiercely independent mother, may or may not be losing her grip on reality, and we seek answers along with the constellation of family, friends, neighbors, and townspeople whose lives intertwine with hers. Each new viewpoint calls up singular memories and intrigue, raising stakes while the twister gathers force. As the storm drives into the heart of town secrets are illuminated, pasts are resurrected, and lives are shaken to the core. An unforgettable debut from a keen observer and chronicler of nature, people, and the ineffable. Awarded the Big Moose Prize for the Novel, Twister was published by Black Lawrence Press in December 2015. Twister was selected as a Finalist for the 2016 Housatonic Book Award in Fiction and the 2016 Sarton Women’s Book Award.